What better way to start a sunny & bright Sunday in February than with the promise of a warm beach walk in Summer, all wrapped into a beautiful perfume bottle? I'm so done with the cold, so it's great to look out to the better days ahead. I've always been quite patient with Winter, but this year I can't seem to find a way around my excitement for the sun, long days with friends and adventures that are still to be planned. Just like I've been listening to the Red Hot Chili Peppers cd that I associate with a road trip to the South of France (with Road Trippin' as the ultimate song), I've been gladly using fragrance to teleport myself to fields of beautiful fresh flowers and - let's be honest - cocktails with friends in the evening sun! The in Belgium newly launched brand Aerin (granddaughter of Estée Lauder) offers fragrances that do just that: they capture a mood and bathe you in it. 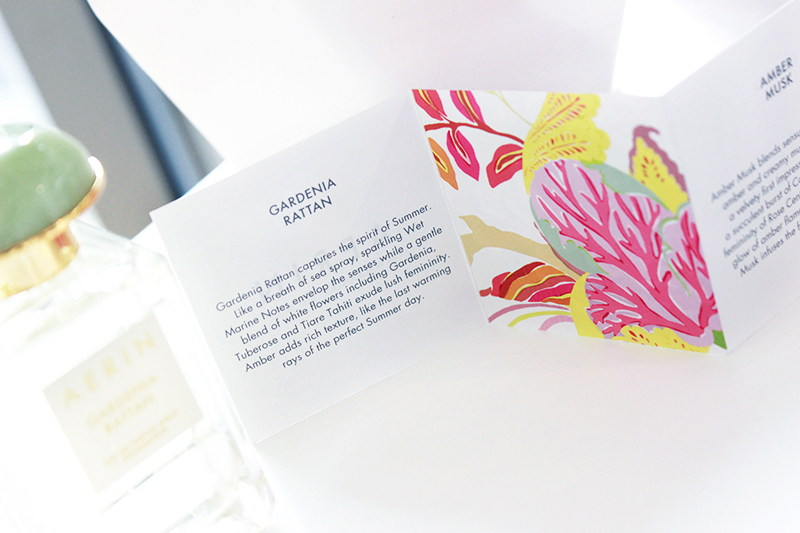 I got Gardenia Rattan to get introduced to the brand, and the little note that came with it was spot on: it promised Summer in a bottle - and that's what I got. It's amazingly wonderful. Gardenia Rattan embodies the perfect Summer day: the warm sun, the sea and fresh flowers. It opens with sea water (Wet Marine) in the top notes, continues with white flowers Gardenia, Tuberose and Tahitian Tiare in the middle notes and finally grows rich like the last warming rays of sun with Amber. 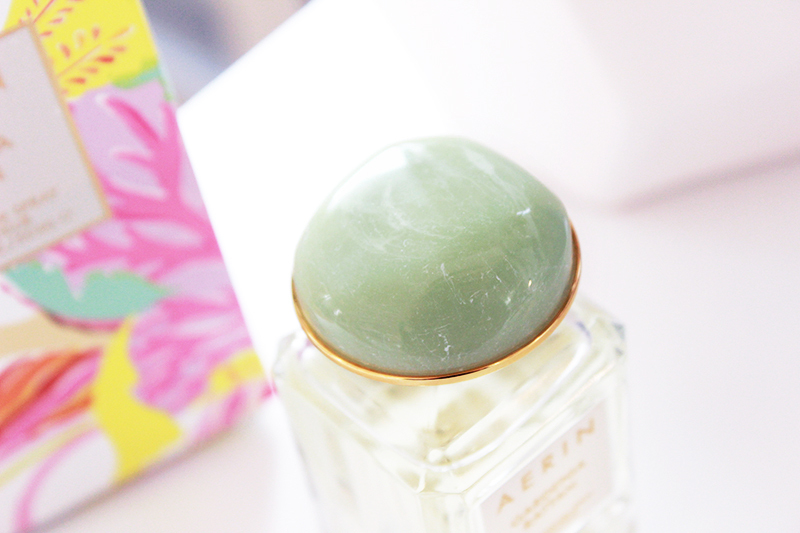 Discover more about the philosophy behind this scent here. The scent is beautifully composed and because I can't find many words to accurately describe it: unique. It's like nothing I own - and while of course every fragrance has their own composition, some are easily put in the same categories and leave the same kind of impression. This one has its own category - it's full, enticing and addictive in the way that it transforms your mood and takes your thoughts elsewhere. And any fragrance that takes me to the beach and offers me a beautiful white floral bouquet has my attention..
And not only the fragrance is a true indulgence; the packaging is beautiful too. The boxes feature fabric designs from Aerin Lauder's home and clothing line (please make your way to Belgium too), and each bottle is decorated with a coloured stone that symbolises the color of one of the ingredients in the perfume. For Gardenia Rattan, it's a beautiful green stone. This is the kind of bottle you'll want to keep on your vanity table; although keep in mind that if you intend to keep this one for a long time you'll have to store it in a dark place as the bottle is see-through. 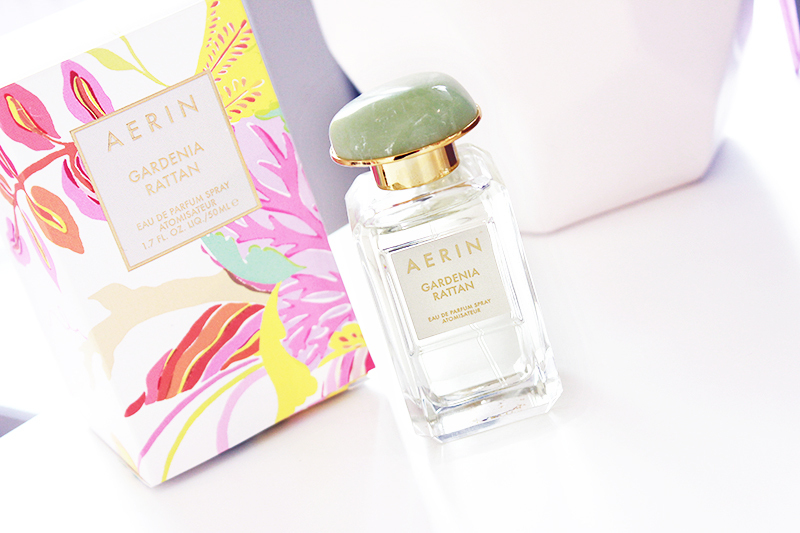 Aerin is available in Belgium now in the Aerin corner on the Estée Lauder webshop. 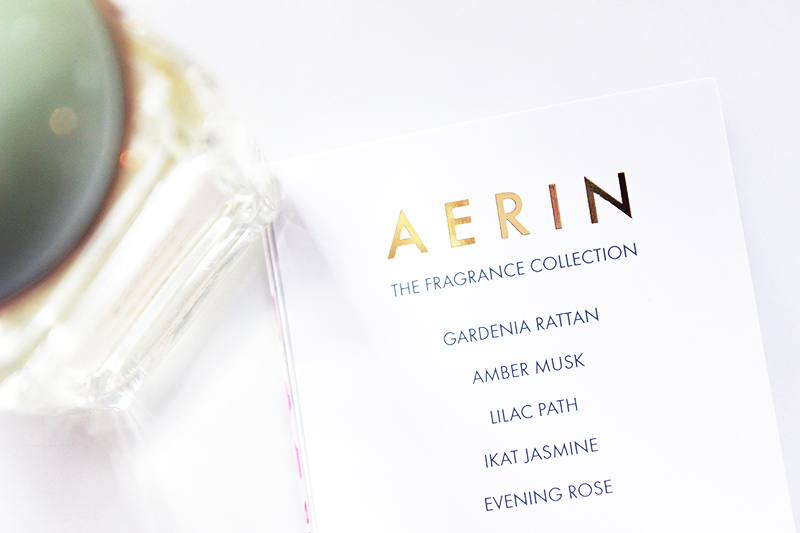 If you want to try the available scents out for yourself before purchasing, you'll have to wait a little longer until March 16th when Aerin launches at Estée Lauder counters in Galleria INNO stores.